Hallux Valgus (HV) is a common deformity of the forefoot. It is more prevalent in females and the elderly, and characterized by malposition of the first metatarsophalangeal joint caused by lateral deviation of the proximal phalanx of the great toe combined with medial deviation of the first metatarsal bone with bunion formation. Conservative treatments include properly fitting footwear, stretching, and the use of an orthosis. However, the value of conservative treatment has been questioned. If conservative treatment fails, surgical treatment may be considered. Over 150 different operation techniques have been described for the correction of HV . Good clinical results have been reported with proximal metatarsal osteotomies, distal metatarsal osteotomies, and diaphyseal metatarsal osteotomies . Minimally invasive surgery is becoming increasingly common. 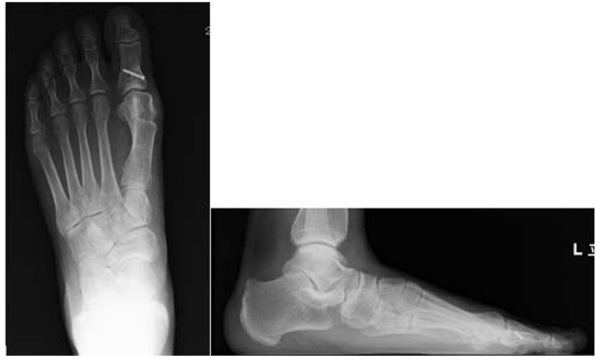 Distal linear metatarsal osteotomy (DLMO; modified Bösch technique) as a minimally invasive technique has been performed for the correction of mild-to-moderate HV [3-6]. DLMO has the advantages that it is technically easy to perform, has relatively short operating times, and low complication rates. The technique was developed for rapid recovery and better cosmetic appearance, and satisfactory clinical results have been reported to this end in previous studies [3-5, 7-9]. DLMO consists of fixation with a single K-wire that passes under the subcutaneous tissue to the distal end of the big toe. This approach has so far not been applied to cases of Hallux Valgus Interphalangeus (HVI) deformity occurring together with hallux valgus. HVI is defined as a lateral deviation of the distal phalanx of the big toe that exceeds 10° . This retrospective, descriptive study included 10 patients (10 feet) who had been diagnosed with both HV and HVI and were treated with DLMO-A between November 2012 and November 2016 at our institution. Of the 10 patients, nine were female and one was a male. The mean age at surgery was 59.8 years (range, 43–77 years), and the mean duration of follow-up was 20.2 months (range, 12–31 months). The inclusion criterion was painful primary mild-to-moderate HV with idiopathic HVI deformity (Fig. 1). The exclusion criteria were hallux rigidus and a history of previous surgery of the affected great toe. All patients received conservative treatment for at least three months before surgery. Clinical and radiographic investigations were performed at the initial examination and at the final outpatient follow-up visit. With regard to clinical assessments, we evaluated the Japan Society for Surgery of the Foot (JSSF) score, the Visual Analog Scale (VAS) score, and recorded any postoperative complications. The JSSF score is a 100-point clinical score comprising the following three items: a pain score (40 points maximum), functionality (45 points maximum), and alignment (15 points maximum) . The VAS score ranges from 0 to 10, with 0 representing no pain and 10 representing the worst pain imaginable. Additionally, the self-administered foot evaluation questionnaire (SAFE-Q) score [12, 13] was used. The SAFE-Q has the following five subscales: 1) pain and pain-related, 2) physical functioning and daily living, 3) social functioning, 4) shoe-related, and 5) general health and well-being. The subscales are scored from 0 to 100. With regard to radiographic assessments, we evaluated the HV Angle (HVA), first Intermetatarsal Angle (IMA), and HVI Angle (HVIA) in standing dorsoplantar and lateral radiographs (Fig. 2). Fig. (1). 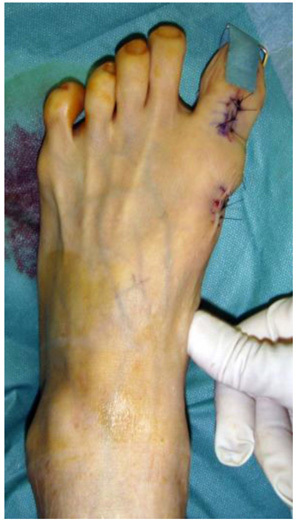 Representative preoperative image of hallux valgus with hallux valgus interphalangeus deformity (case 4). In all patients, surgery was performed in the supine position under epidural anesthesia with intravenous sedation, a pneumatic ankle tourniquet (pressure set to 250 mmHg), and an image intensifier. Akin closing wedge osteotomy was per-formed at the middle of the proximal phalangeal shaft through a 1.5 cm dorsal skin incision. The first osteotomy was performed parallel to the phalangeal base, and the second osteotomy was performed parallel to the articular surface of the phalangeal head. The thickness of the bony wedge was decided based on the required correction of the HVIA. Fixation was performed with one mini screw or K-wire from the proximal to the distal part of the phalanx. Lateral soft tissue release was performed for the first and second metatarsal heads through a 1.5 cm dorsal skin incision if HV could not be corrected with closed manual reduction. In the next step, a 1.5 cm skin incision was made on the medial aspect of the neck of the first metatarsal bone. A periosteal elevator was used to strip the neck of the first metatarsal bone. A 2.0 mm K-wire was inserted manually from the incision to the medial side of the big toe using the retrograde technique. Osteotomy was performed with a micro-bone saw at the subcapital level of the metatarsus, perpendicular to the metatarsal shaft in the sagittal plane, and parallel to the metatarsal shaft in the coronal plane. Lateral translation of the distal fragment was sufficiently obtained, and the K-wire was pushed back into the medullary canal of the first metatarsal shaft (Figs. 3 and 4). Fig. (2). Representative preoperative dorsoplantar and lateral radiograph of hallux valgus with hallux valgus interphalangeus deformity. Hallux valgus with deformity of hallux valgus interphalangeus (case 4). Fig. (3). 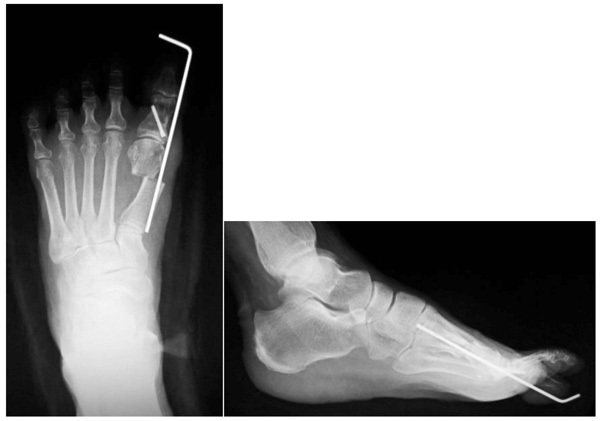 Representative postoperative dorsoplantar and lateral radiographs of the correction with distal linear metatarsal osteotomy with Akin osteotomy. Akin osteotomy fixation of proximal phalanx using a small headless screw and DLMO fixation of metatarsus using a 2.0 mm K-wire (case 4). Fig. (4). Postoperative image with the location of incisions. The photograph shows the result of the minimally invasive approach with two 1.5 cm (dorsal and medial) sutures of the skin (case 4). Table 1. Clinical and radiographic outcomes of 10 patients after distal linear metatarsal osteotomy with Akin osteotomy. Table 2. Pre- and post- operative Japan Society for Surgery of the Foot (JSSF) and Visual Analog Scale (VAS) scores. The mean HVA significantly improved from 31.5° (preoperatively) to 7.7° (postoperatively) (p < 0.001), the mean IMA from 11.7° to 5.5° (p < 0.001), and the mean HVIA from 17.2° to 5.8° (p < 0.001) (Figs. 5-7 and Table 4). No patient developed transfer metatarsalgia, infection, non-union, malunion, or avascular necrosis of the first metatarsal head. However, a mild restriction of the range of motion of the inter-phalangeal joint was observed postoperatively in one patient. Table 3. Pre- and postoperative self-administered foot evaluation questionnaire subscale scores. Fig. (5). Representative dorsoplantar and lateral radiographs 29 months after DLMO-A. Complete healing of the osteotomies is visible (case 2). Fig. (6). Representative dorsoplantar and lateral radiographs 31 months after DLMO-A. Complete healing of the osteotomies is visible (case 1). Fig. (7). Representative dorsoplantar and lateral radiographs 18 months after DLMO-A. Complete healing of the osteotomies is visible (case 4). Table 4. Pre and postoperative radiographic measurements of angles relevant for outcomes in hallux valgus. Many different surgical procedures have been described for the surgical treatment of HV depending on the degree of the deformity. In recent years, minimally invasive surgery has become increasingly common [3-5, 7-9, 14-16]. Percutaneous distal first metatarsal osteotomy was first described by Bösch et al. in 1990 , and satisfactory results were reported in 2000 . Magnan et al. reported a mean total American Orthopedic Foot and Ankle Society score of 88.2 (out of a total of 100) using percutaneous distal osteotomy . Seki et al. reported a mean total JSSF score of 90.4 using DLMO with selective release of lateral soft tissue after a mean postoperative follow-up of 38.8 months . In our study, a mean total JSSF score of 90.0 was documented for a mean postoperative follow-up of 20.2 months, and there were no serious complications. However, a mild restriction of the range of motion of the interphalangeal joint was observed postoperatively in one patient. We considered this joint stiffness to be associated with the K-wire placement to temporarily fix the metatarsophalangeal and interphalangeal joints. Previous studies have reported K-wire removal four [3, 7-9], six [5, 15], and seven  weeks postoperatively. In the present study, the K-wire was removed six weeks postoperatively. However, we considered that it is necessary to remove the wire earlier, ideally once callus formation is observed. At the same time, complications and poor outcomes have been reported for minimally invasive methods in other articles [14, 16]. Therefore, the use of DLMO for the treatment of HV is still controversial. DLMO involves fixation with only a single K-wire that is passed under the subcutaneous tissue to the distal end of the big toe. Accordingly, DLMO has not been applied for HV with HVI deformity. We decided to use DLMO and additionally perform Akin osteotomy to improve fixation. Akin osteotomy is a popular technique for isolated HVI [17-19], and the fixation in Akin osteotomy can also be performed with a K-wire, monofilament wire or screw [20, 21], which aligns with the minimally invasive approach of DLMO. Chiang et al. reported that Bösch osteotomy, despite a generally reliable correction of the deformity, resulted in 12.5% of early arthritic changes . They explained the degenerative change as being related to an increased reactive force after extensive correction and immobilization of the metatarsophalangeal joint with a K-wire. We believe that overcorrection of HV with a single K-wire in case of concomitant HVI can increase the stress load on the metatarso-phalangeal joint, and alignment correction with the Akin procedure can help to reduce the stress load on the metatarso-phalangeal joint. 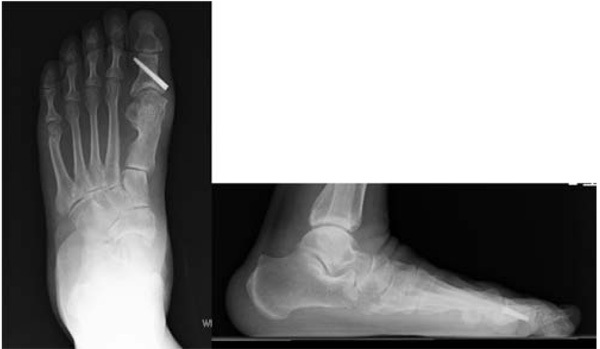 Wagner E, Ortiz C. Osteotomy considerations in hallux valgus treatment: Improving the correction power. Foot Ankle Clin 2012; 17(3): 481-98. Wülker N. Hallux valgus Orthopade 1997; 26(7): 654-64. 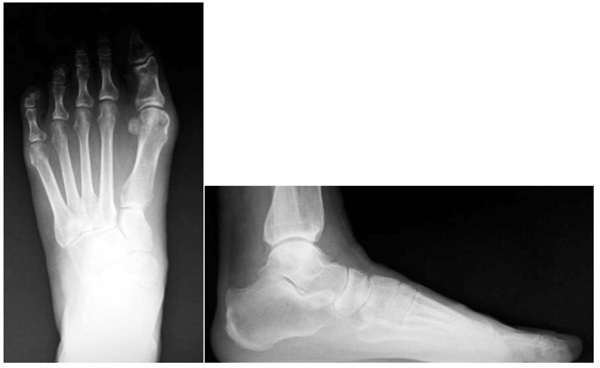 Bösch P, Wanke S, Legenstein R. Hallux valgus correction by the method of Bösch: a new technique with a seven-to-ten-year follow-up. Foot Ankle Clin 2000; 5(3): 485-498, v-vi. Magnan B, Pezzè L, Rossi N, Bartolozzi P. Percutaneous distal metatarsal osteotomy for correction of hallux valgus. J Bone Joint Surg Am 2005; 87(6): 1191-9. Angthong C, Yoshimura I, Kanazawa K, Hagio T, Ida T, Naito M. Minimally invasive distal linear metatarsal osteotomy for correction of hallux valgus: A preliminary study of clinical outcome and analytical radiographic results via a mapping system. Arch Orthop Trauma Surg 2013; 133(3): 321-31. Chiang CC, Lin CF, Tzeng YH, Huang CK, Chen WM, Liu CL. Distal linear osteotomy compared to oblique diaphyseal osteotomy in moderate to severe hallux valgus. Foot Ankle Int 2012; 33(6): 479-86. Seki H, Suda Y, Takeshima K, et al. Minimally invasive distal linear metatarsal osteotomy combined with selective release of lateral soft tissue for severe hallux valgus. J Orthop Sci 2018; 23(3): 557-64. Giannini S, Faldini C, Nanni M, Di Martino A, Luciani D, Vannini F. A minimally invasive technique for surgical treatment of hallux valgus: Simple, effective, rapid, inexpensive (SERI). Int Orthop 2013; 37(9): 1805-13. Coughlin MJ, Saltzman CL, Nunley JA II. Angular measurements in the evaluation of hallux valgus deformities: A report of the ad hoc committee of the American Orthopaedic Foot & Ankle Society on angular measurements. Foot Ankle Int 2002; 23(1): 68-74. Niki H, Aoki H, Inokuchi S, et al. Development and reliability of a standard rating system for outcome measurement of foot and ankle disorders I: Development of standard rating system. J Orthop Sci 2005; 10(5): 457-65. Niki H, Tatsunami S, Haraguchi N, et al. Validity and reliability of a self-administered foot evaluation questionnaire (SAFE-Q). J Orthop Sci 2013; 18(2): 298-320. Niki H, Haraguchi N, Aoki T, et al. Responsiveness of the Self-Administered Foot Evaluation Questionnaire (SAFE-Q) in patients with hallux valgus. J Orthop Sci 2017; 22(4): 737-42. Kadakia AR, Smerek JP, Myerson MS. Radiographic results after percutaneous distal metatarsal osteotomy for correction of hallux valgus deformity. Foot Ankle Int 2007; 28(3): 355-60. Oliva F, Longo UG, Maffulli N. Minimally invasive hallux valgus correction. 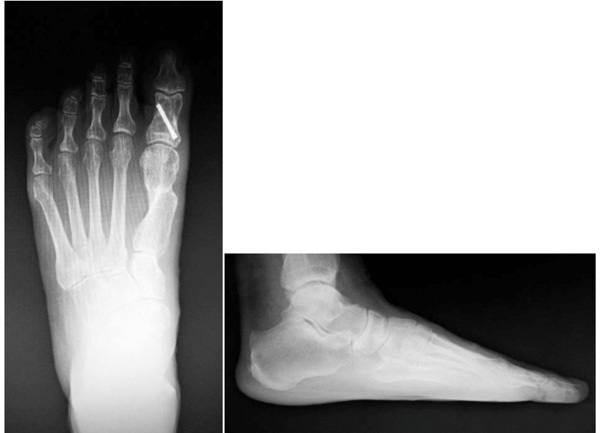 Orthop Clin North Am 2009; 40(4): 525-530, x.
 Iannò B, Familiari F, De Gori M, Galasso O, Ranuccio F, Gasparini G. Midterm results and complications after minimally invasive distal metatarsal osteotomy for treatment of hallux valgus. Foot Ankle Int 2013; 34(7): 969-77. Vander Griend R. Correction of hallux valgus interphalangeus with an osteotomy of the distal end of the proximal phalanx (distal Akin osteotomy). Foot Ankle Int 2017; 38(2): 153-8. Martinelli N, Giacalone A, Bianchi A, Hosseinzadeh M, Bonifacini C, Malerba F. Distal Akin osteotomy for hallux valgus interphalangeus. Foot Ankle Surg 2018; 24(3): 205-7. Douthett S, Plaskey N, Fallat L, Kish J. Retrospective analysis of the Akin osteotomy. J Foot Ankle Surg 2018; 57(1): 38-43. Langford JH. ASIF Akin osteotomy: A new method of fixation. J Am Podiatry Assoc 1981; 71(7): 390-6. Murphy JS, Mozena JD, Walker RE. J-wire technique for fixation of the Akin osteotomy. J Am Podiatr Med Assoc 1989; 79(6): 291-3.